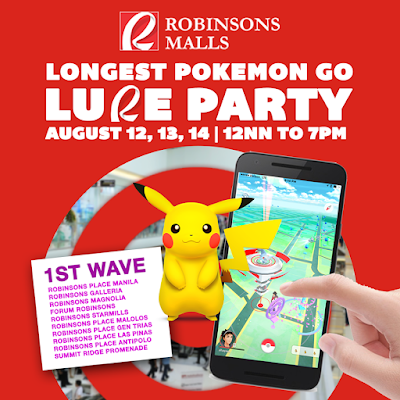 Here's another reason to head to the malls this weekend! Shopping Malls & establishments (SM Malls, Ayala Malls, Eastwood, Araneta, Shangri-la Plaza Mall, Capitol Commons, Greenfield District, and more!) are having a PokemonGo Lure Party! Check out the list of Pokestops HERE. Let's go shopping and hunting! 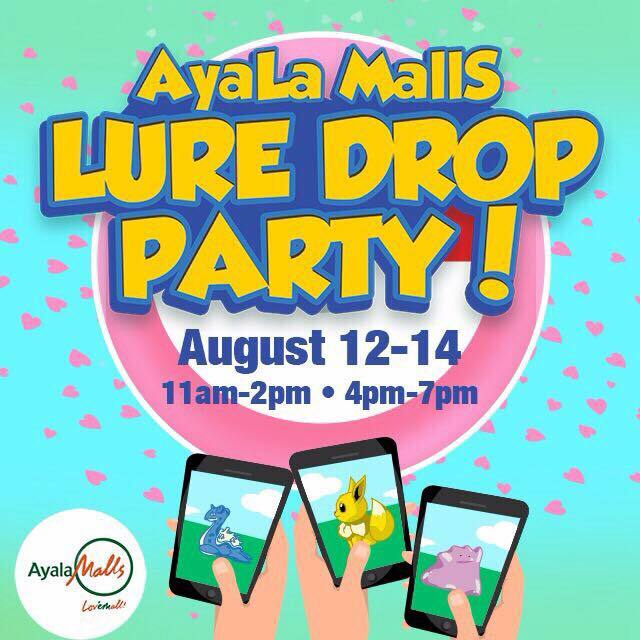 Lure Drop party in all Ayala Malls: Glorietta, TriNoma, Market! Market!, Greenbelt, UP Town Center, Fairview Terraces, Boni High Street (11th to 5th Avenue), Nuvali Ayala Center Cebu, etc - nationwide on August 12-14, 2016 between 11am & 2pm, and from 4pm to 7pm. 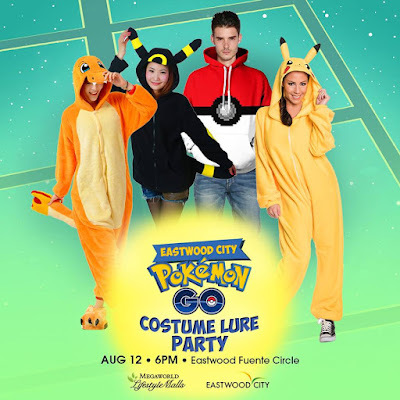 Catch them all and join the biggest Pokémon Lure and Costume Party at Eastwood City on August 12 (Friday)! Dress up as your favorite Pokémon character, test your trainer knowledge at the Pokémon Quiz Night, enjoy non-stop party music, and expand your Pokédex with UNLIMITED lures from 6pm to 9pm. 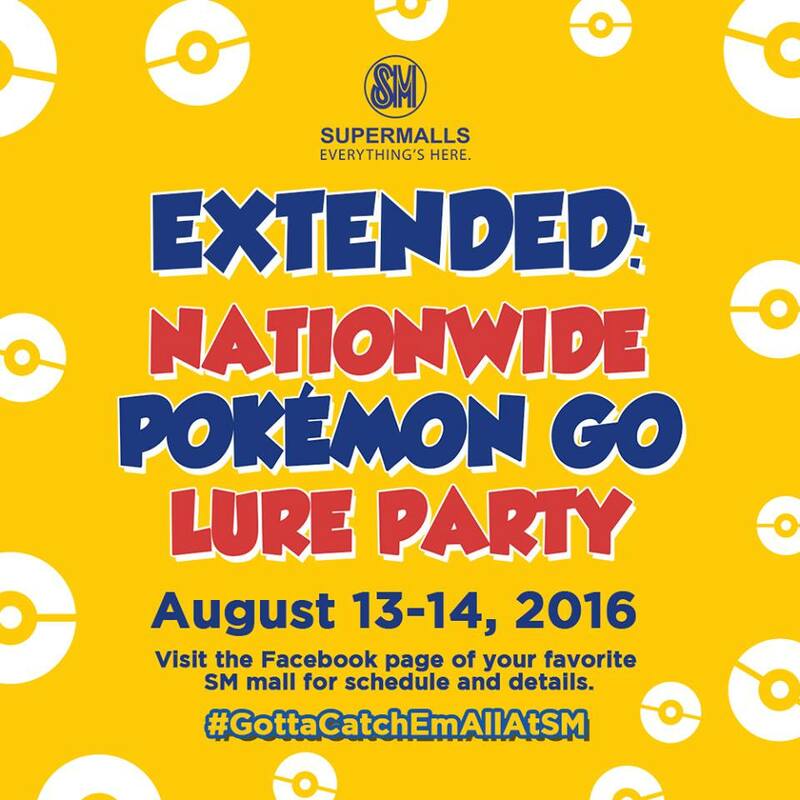 #GottaCatchEmAllAtSM Nationwide PokemonGo Lure Party in All SM Malls on Friday August 12-14 2016 from 5pm to 9pm. 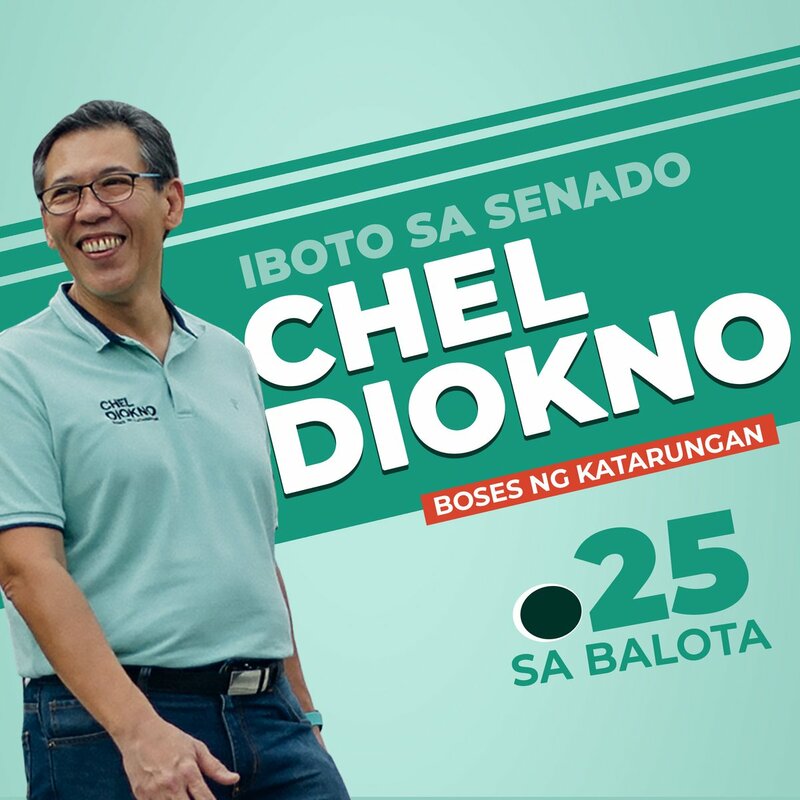 Check this out in all SM Malls nationwide! Check out also McDonald's Buy1 Take1 McFloat Promo at participating McDo branches in SM Malls! 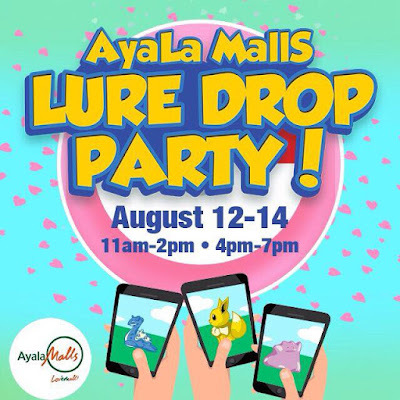 Century City Mall has 3-day Lure Fun Fest happening on August 12-14, 2016 from 11am to 9pm. 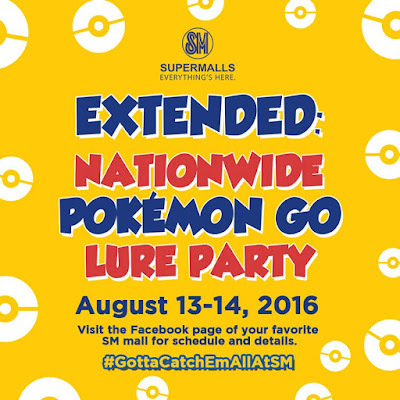 Araneta Center's The Ultimate Pokemon Tour happens on August 12, 2016 starting at 3pm. 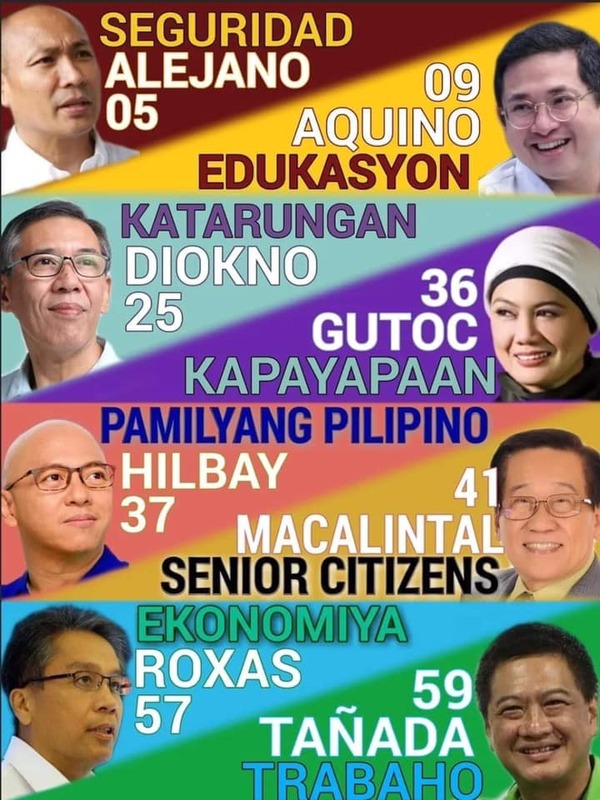 Just wait at the 20 PokéStops at the Araneta Center. 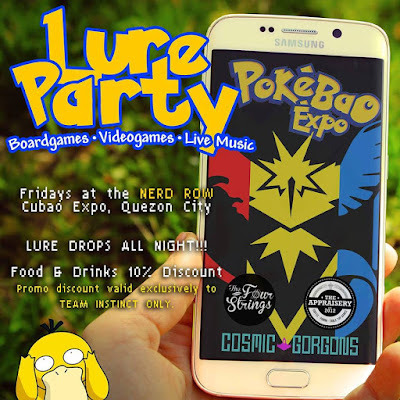 Pokemon-Go Lure Party hosted by Cubao Expo's Nerd Row (The Appraisery Boardgame Cafe, Cosmic Gorgons Gaming & Art Lounge, and The Four Strings Uke Hub). 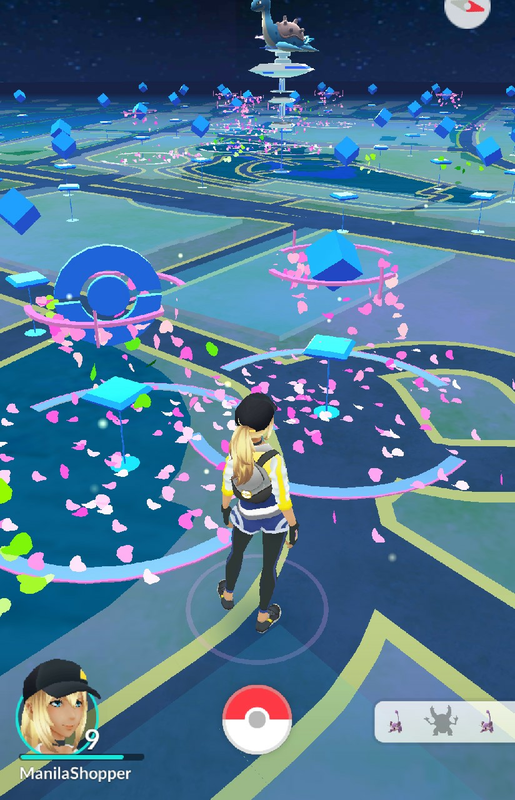 Lures drop sporadically from 7pm to 12mn. 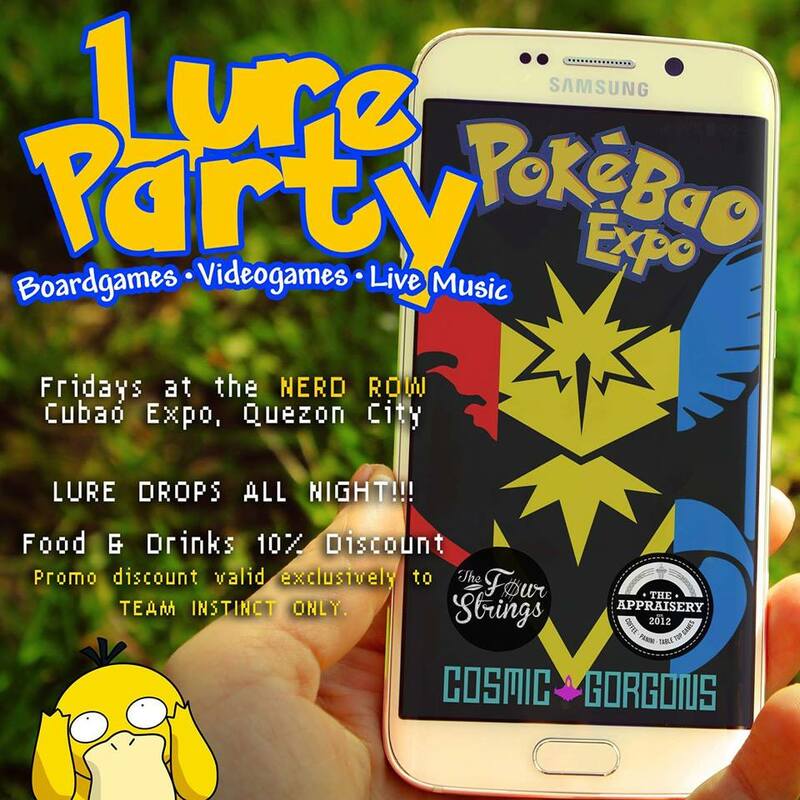 Catch 'em all while playing boardgames, downing beers, playing the latest videogames, and jamming to live music. This is not your boring ol' grandpa's lure party (like they have in the malls). 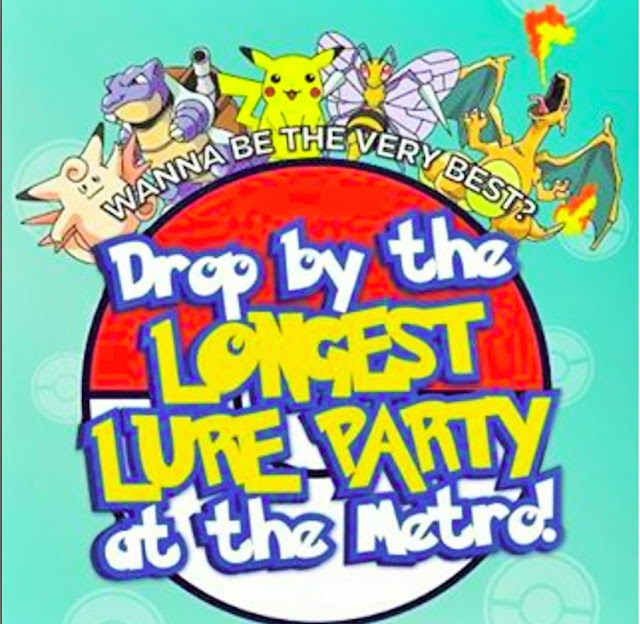 Shangri-la Plaza Mall is also holding the longest Lure Party in the Metro! Visit the Pokestops at The Shang from August 12 to 21, 2016 and take advantage of The Shang's Lure Party from 3pm to 7pm DAILY! 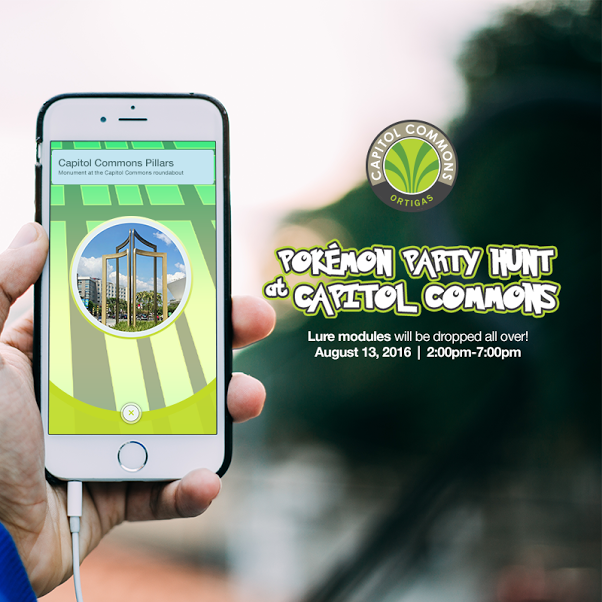 Pokemon Party Hunt also happening at Capitol Commons on August 13, 2016 from 2pm to 7pm. 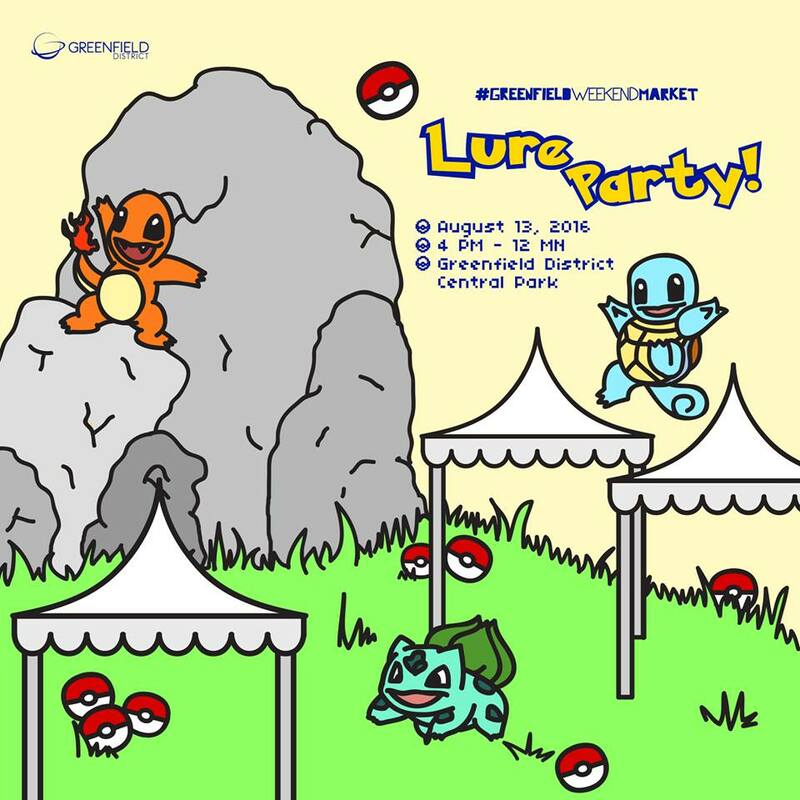 Greenfield Weekend Market joins the bandwagon! 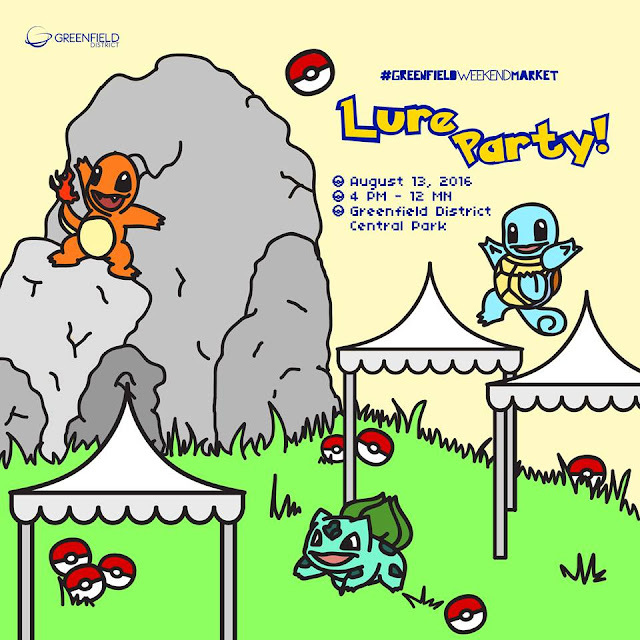 They're also having a PokemonGo Lure Party on August 13, 2016 from 4pm to 12mn at Central Park, Greenfield District.